Getting your business to #1 on Google is the panacea trumpeted by hordes of spammers every day. Certainly each morning I’m greeted with a fresh slew of emails from self-professed SEO gurus heading “professional marketing companies” (who oddly lack a business name, logo, website, or any other relevant details to substantiate their claims) promising me the world of riches if only my underachieving, low ranking website was ranking at #1!!!! Of course, I shouldn’t be so cynical. I’m sure it’s only because they’re “highly skilled SEO marketing gurus” that they were able to find my site which – according to them – no one else would have a snowball’s chance in hell of doing so. No one can guarantee a #1 ranking on Google. Beware of SEOs that claim to guarantee rankings, allege a “special relationship” with Google, or advertise a “priority submit” to Google. And this is for a number of reasons. Your IP address is a set of numbers which identify your computer based on your network connection which will change if you connect to the internet from a different network host (such as if you login to a device from a WiFi hotspot at your favourite cafe, or the airport). From here, it’s all pretty techie and confuses the hell out most people (me included), but essentially, your IP address can change the results you see based on routers and networks and the magic fairies that live in internet. For instance, when I’m connected to my modem at home, I often get results from NSW or VIC – even though I’m in South Australia – as my IP address seems to have me located in Albury Wodonga on the border. My mobile modem, however, puts my location in Adelaide, and so the results I get between my home connection and mobile modem can be very different indeed. As you can see, the IP address has altered the search results accordingly. 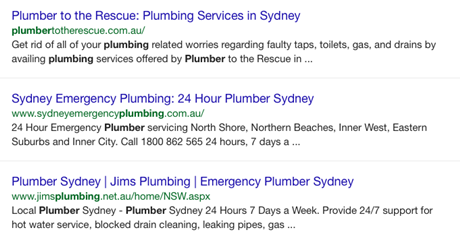 Google have been personalising search results for all their users since 2009 as part of their drive to deliver more relevant search results to you. So, if you were a car buff and entered the term “jaguar”, chances are most of your search results would include sites about cars, based on your search history. Conversely, if you worked at a zoo or had a thing for big cats, your search for “jaguar” might turn up a completely different set of search results. The following 4 screenshots show how much my top 5 results for the term “copywriter” change between being signed in or out of Google, as well as the IP location of my home and mobile modems. 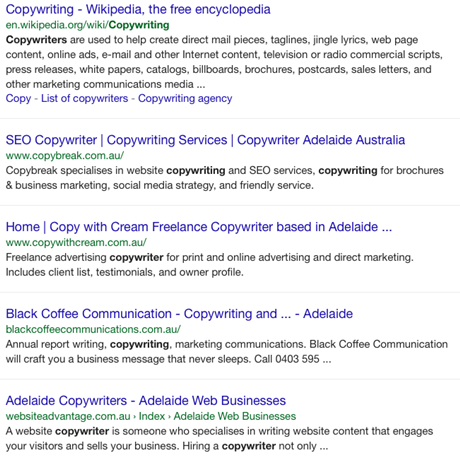 As you can see, while Wikipedia holds the #1 position on all counts, the results for the SAME search term vary significantly for the remaining positions… and I’m sure if you typed “copywriter” into your browser, you’d see very different results again. There are ways you can opt out of personalised results (to a degree), or you can regularly clear your search history to get less ‘biased’ results – but honestly, who can be bothered, right? Finally, you may also get different results based on different devices for a number of reasons, including locality, search filters, algorithms, etc. 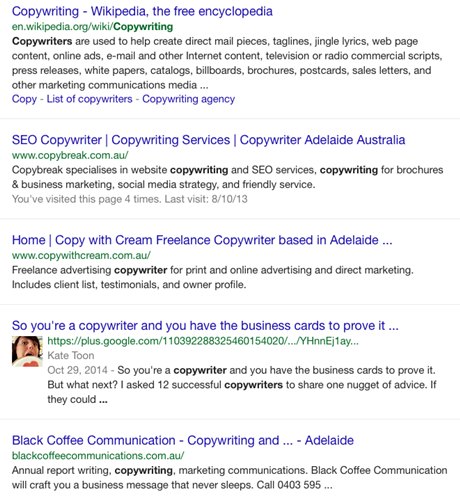 Google is increasingly focused on the intent and context of search queries. It understands that these vary between devices, and consequently delivers results differently on mobile phones and traditional computers. He goes on to explain that mobile searches are impacted by certain information provided about the searcher, such as their location, which can vary the results. As you can see, trying to get to #1 on Google is not so simple! There are a number of factors which are going to affect what any person will see in their search results. 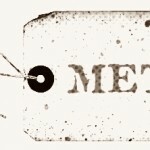 So how can you rank well on Google and other search engines? 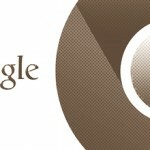 The first thing you should do is acquaint yourself with Google’s Webmaster Guidelines. These go through all the things you should and shouldn’t do to ensure your site ranks well. 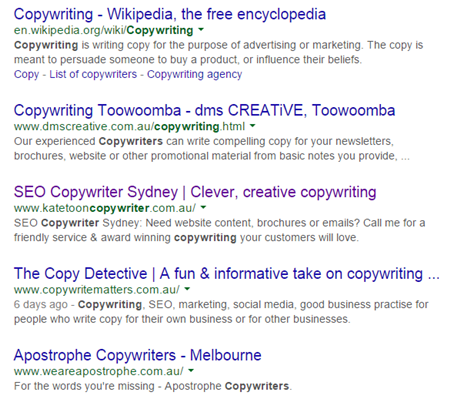 Additionally, a good SEO copywriter will be able to craft fantastic copy for you that not only ticks most of these boxes, but also appeals to your audience. 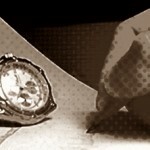 Finally – get connected! Having a strong social media presence can make a huge impact on personalised results. 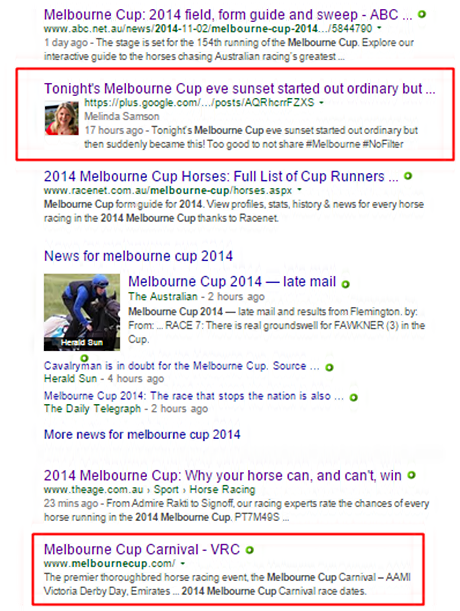 A recent example: on Melbourne Cup day, I couldn’t remember what time the race was on, so I Googled “Melbourne Cup 2014”. At #2 was a post from a connection of mine about a sunset on the eve of the cup. 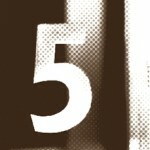 The official Melbourne Cup site was #5! 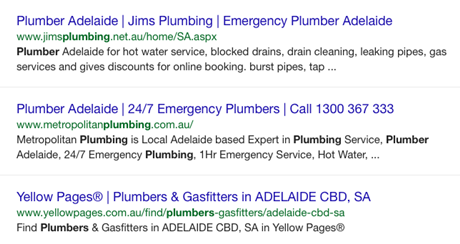 Sure, those results are totally different today, but timely postings (particularly through Google Plus) with relevant keywords can really boost your page position, even if briefly. So bottom line – stop focusing on position and focus on good quality content and building relationships with your audience. Got questions? 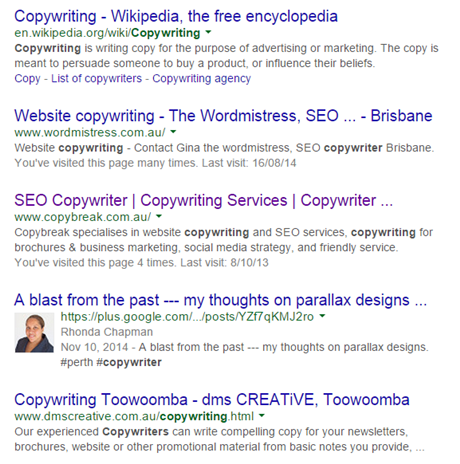 Or did you Google “copywriter” to see what came up #1 for you? Share below! Blimey, Jim the Plumber must be a very busy chap if he covers Sydney AND Adelaide!! LOL… Jim’s is a home maintenance franchise, so I think “Jim” is probably off on his yacht counting his millions! But yeah, it can come to some people as quite a surprise finding out their site doesn’t rank as well for other people as it does for them. That said, I recently demonstrated this to some lovely clients who were DELIGHTED to discover that their “main competition” didn’t rank as highly for other people as they did for them.